Welcome to Mike’s! From towing and road service, auto and truck repair, and off-road diesel fuel delivery to knuckle boom crane and environmental clean-up services; whatever it is you need- Mike’s has you covered! Review Stream Powered by OMG National | © Copyright 2019. 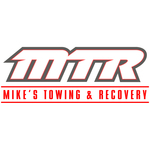 Mike's Towing & Recovery. All Rights Reserved.